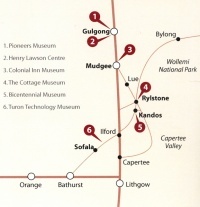 In the late 1990s, six historical societies/museums in the Central West area of New South Wales started to meet informally to foster closer links and to discuss common problems. As a result of local government amalgamations in the early 2000s, these six museums were all located in the same local government area: the Mid-Western Regional Council. The Cudgegong Valley Museums Group was subsequently incorporated. The aim of this body is to foster co-operation between member museums and to promote a heritage trail of the six fascinating and varied museums within the group.